Flames and smoke billow from the roof of the house at 1505 L St. Monday night as firefighters work to put out the blaze. 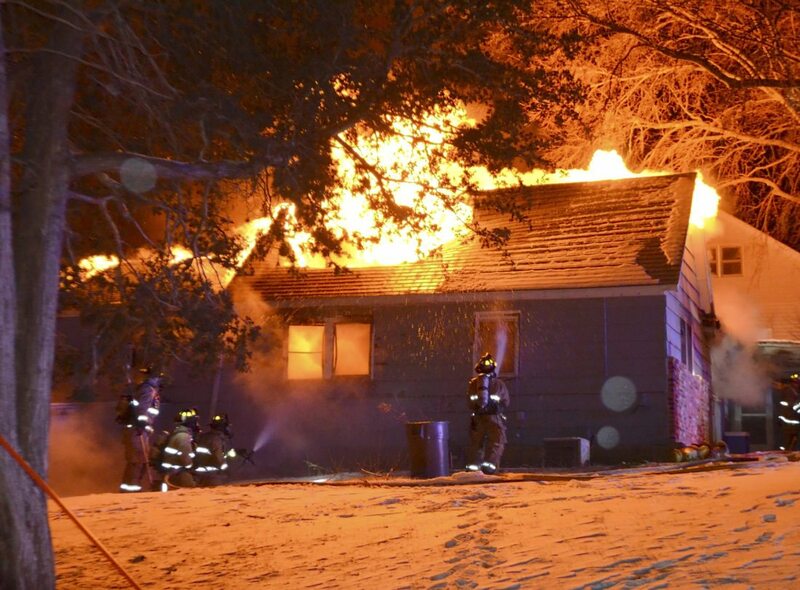 The fire claimed the life of a dog that was inside. Fort Dodge Firefighter Ashley Jochum moves the water cannon atop the Fire Department’s new engine by remote control. That remote control function is one of the unique features of the truck delivered in late 2017. 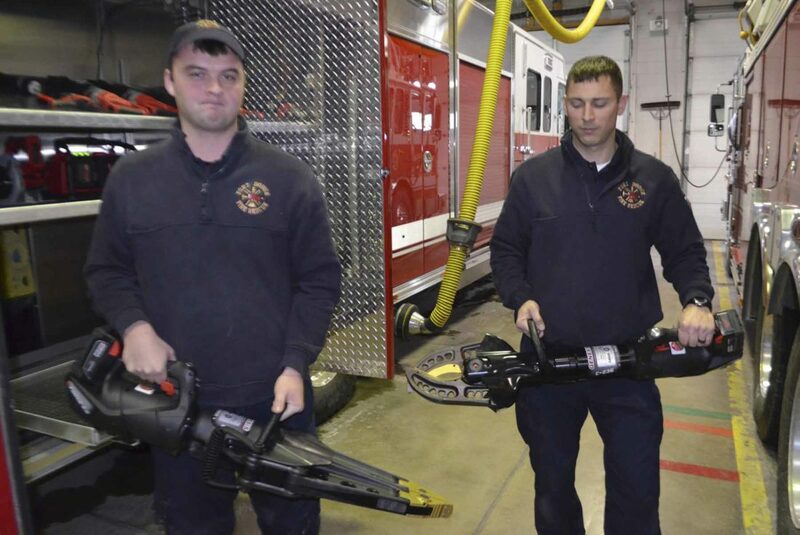 Fort Dodge firefighters Andy Hull, left, and Ben Waynar show off the new battery powered rescue tools used for freeing people from wrecked cars. 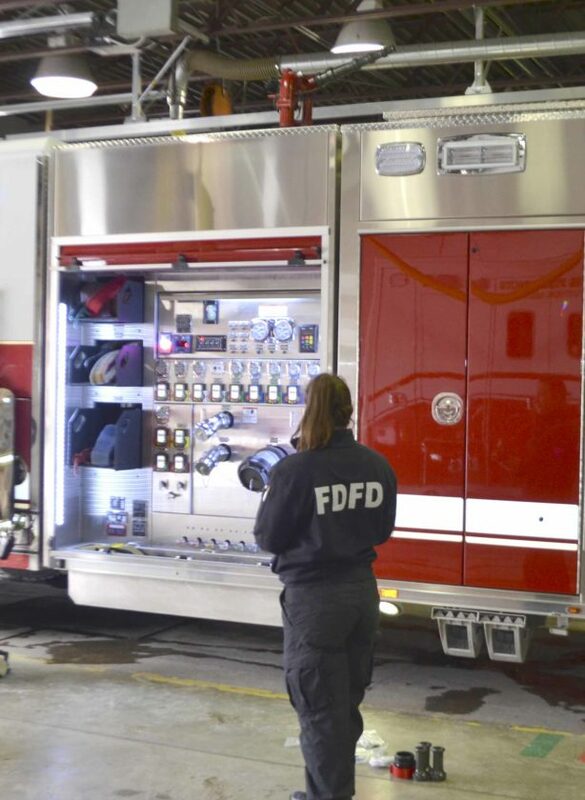 The new tools take up less space in a fire truck and are quieter than older versions. This fire alarm box once stood at the corner of Central Avenue and Seventh Street. Now it’s in the office of Fire Chief Steve Hergenreter. 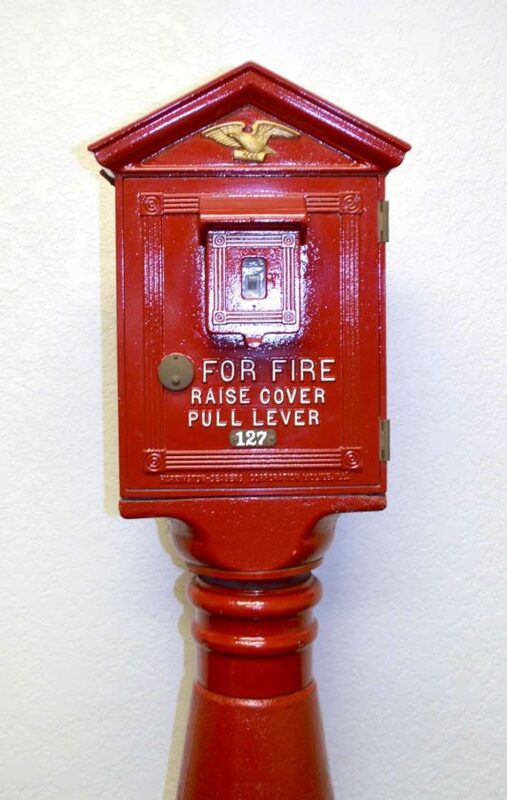 Fire alarm boxes were the primary way of calling firefighters to an emergnecy from the mid 1800s until the 1970s. 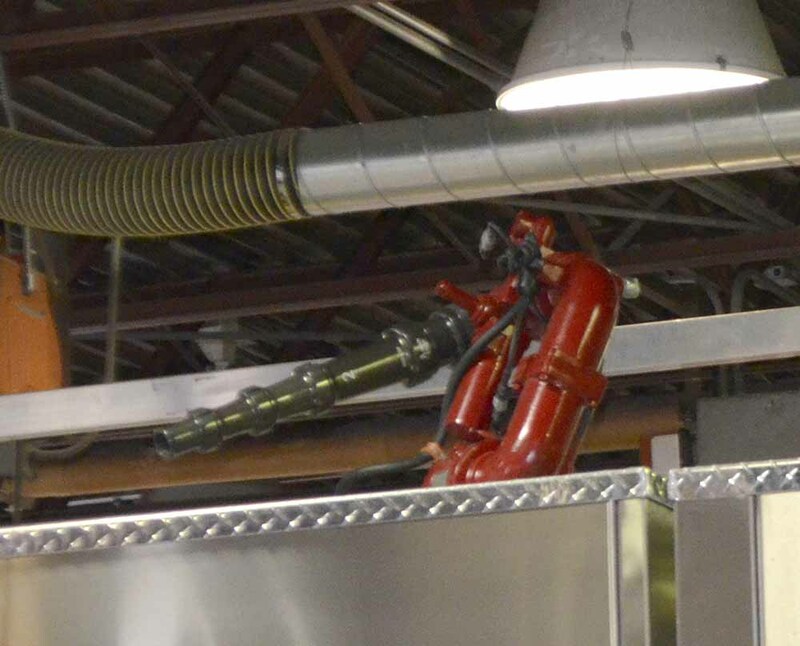 This water cannon atop the Fort Dodge Fire Department’s new engine can be turned by a firefighter standing several feet away using a remote control box. 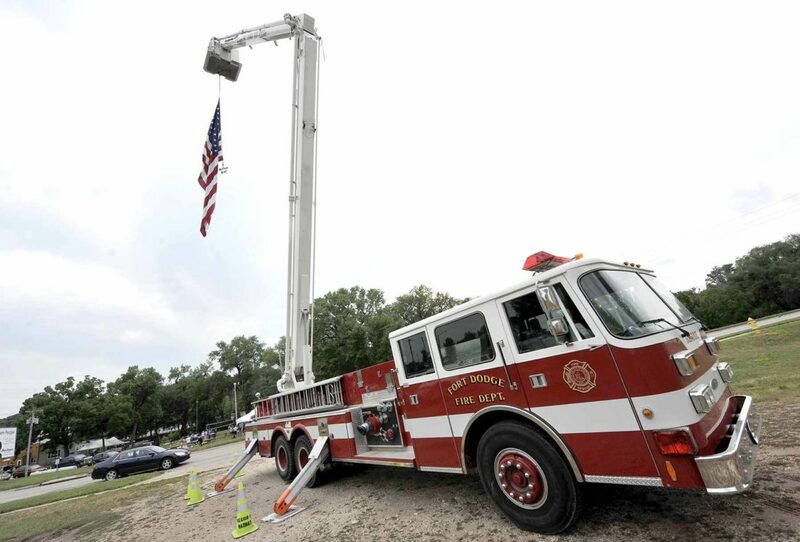 The Fort Dodge Fire Department brought their aerial truck and giant flag to the Silent Auction segment of the Fort Dodge Firefighter’s Association Golf Tournament held at Amigo’s. Fort Dodge firefighter Meghan Spears proudly carries the flag Saturday morning as she leads the department’s trucks during the annual Frontier Days Parade Saturday morning along Central Avenue in downtown Fort Dodge. 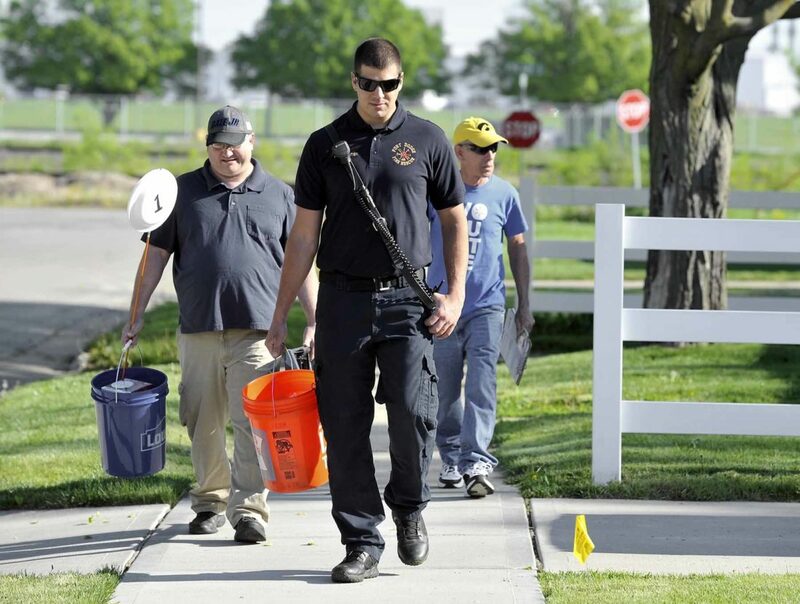 Fort Dodge firefighter Jon Schreck, center, along with volunteers Jack Eastman, right, and Joe Chada, left make their way along the 900 block of South 28th Street Saturday morning during a Smoke Detector Blitz. The effort targeted 520 homes. A new chief, two new captains, two new lieutenants and six new firefighters dramatically reshaped the roster of the Fort Dodge Fire Department in 2017. New faces weren’t the only things new at the Fire Department in the last year. A new pumper was delivered in November and it was put into service in early December. In the coming year, developing a plan to get the 1966 vintage firehouse at 1515 Central Ave. into shape will be a priority. And a new program called Fire Ops 101 is being planned to give local residents a taste of what it’s like to be a firefighter. Fire Chief Steve Hergenreter, who is new to that position, said hiring six new firefighters in one year is a record for the department. 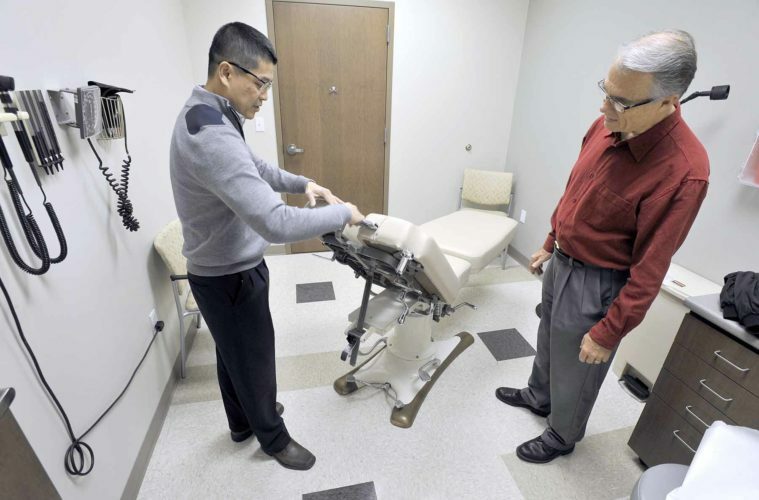 “We’ve been really busy doing intensive training with them,” he said. The wave of hirings was started in August 2016, when the city was awarded a $444,594 Staffing Adequately for Fire and Emergency Response grant from the Federal Emergency Management Agency. It will pay the wages of three firefighter/paramedics for two years. At the conclusion of those two years, the city must find a way to pay for the additional personnel. 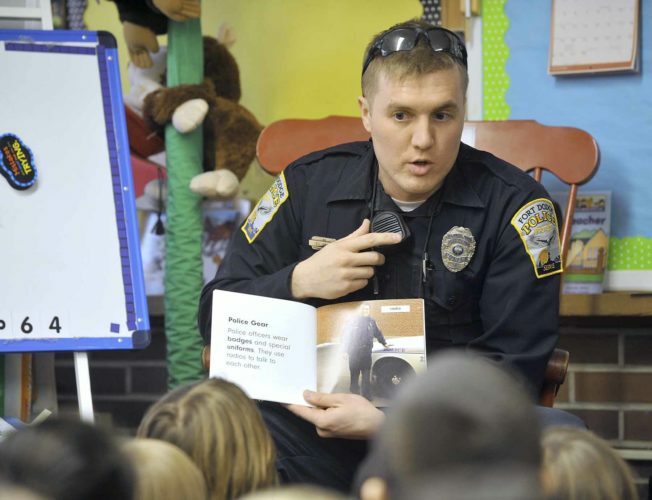 That grant allowed the city to add one more person to each shift. The three new firefighters — Spencer Gratton, Aaron Kampman and Zach Rickman — were hired in December 2016. They increased the department’s roster to 35 members. Hergenreter said adding one more firefighter to every shift has cut the department’s overtime budget by two-thirds. For years, when firefighters were on vacation or sick leave the department had to call in other firefighters and pay them overtime in order to maintain a minimum level of staffing at all times. With each of the three shifts now bigger to start with, the need for overtime to maintain that minimum staffing is much less. In March, Andy Hull was hired as a firefighter to fill a vacancy. Hergenreter, who has been a city firefighter since 1989, was promoted from captain to chief in July to replace Kent Hulett, who resigned to pursue other opportunities. 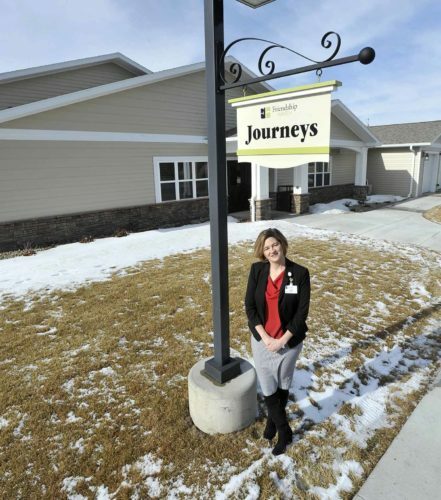 Hulett, who came to Fort Dodge from Illinois, had been chief since June 2013. In July, two more new firefighters — Ashley Jochum and Orlando Peace — were hired. Then in September, Jeff Hill was promoted from lieutenant to captain and Tom Ubben was promoted from firefighter to lieutenant. In November, Capt. Paul Neeson retired after 30 years of service. His retirement led to the promotion of Jason Vandi from lieutenant to captain. At the same time, Eric Conell was promoted from firefighter to lieutenant. In late 2017, Kyle Porter was hired as a firefighter to fill the vacancy created by Conell’s promotion. The new truck, which has the radio call sign Engine 5, was built by Toyne Inc. in Breda. It can pump 2,000 gallons of water a minute and carries 500 gallons of water to be used for putting out small fires or starting an attack on a bigger fire while fireighters are hooking up to a hydrant. It’s powered by a 565 horsepower diesel engine. Hergenreter said the new truck has lots of safety features, such as airbags and soundproofing in the cab. It also has electronic pump controls and a water cannon on top that can be moved by remote control. Engine 5 replaced a 2001 pumper truck which has been kept for use at big fires or when another truck is out of service for repairs. The department also received a six-wheel off-highway vehicle that can be configured to carry water and hose to remote brush fires or it can be set up to carry a patient on a stretcher. The Fort Dodge Fire Department brought their aerial truck and giant flag to the Silent Auction segment of the Fort Dodge Firefighter's Association Golf Tournament held at Amigo's. According to Hergenreter, during 2017 the department started a new in-house officer training program to prepare firefighters for future leadership roles. “It’s been a tremendous benefit,” he said. He added that the new program has ensured that all three shifts of firefighters operate the same way. Also in 2017, the Fire Department launched an effort to work with young people who appear to have a tendency to play with fire. Hergenreter said two firefighters completed training in juvenile fire-setter intervention. This year, the firehouse will be a focus of attention, according to the chief. When the station was built, there were no female firefighters in the department. It was designed for an all-male crew, so it has just one locker room, a long row of sinks, one shower and two bathrooms. When it was constructed, it had one big room where all the beds were. In the late 1990s, that bunkroom was divided up into smaller bedrooms. Hergenreter said a plan is needed to reconfigure the bedrooms, locker room and bathrooms so that male and female firefighters can have privacy. The building’s utilities pose another problem that has to be addressed, he said. There are multiple water and sewer pipes that are leaking. 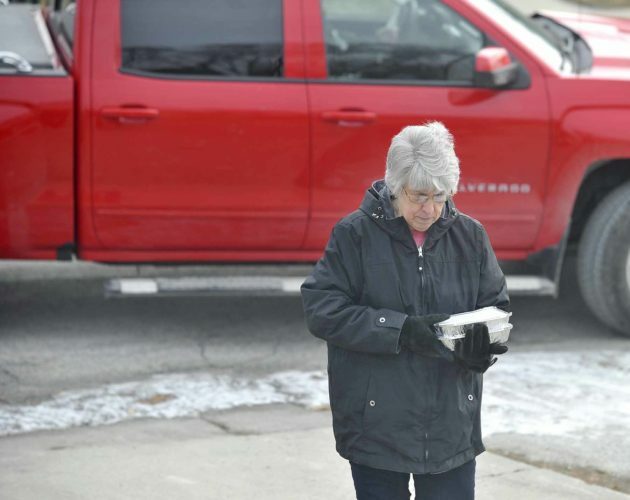 And because some of those water pipes are embedded in the brick and concrete walls of the building, no one knows exactly where the leaks are, Hergenreter said. 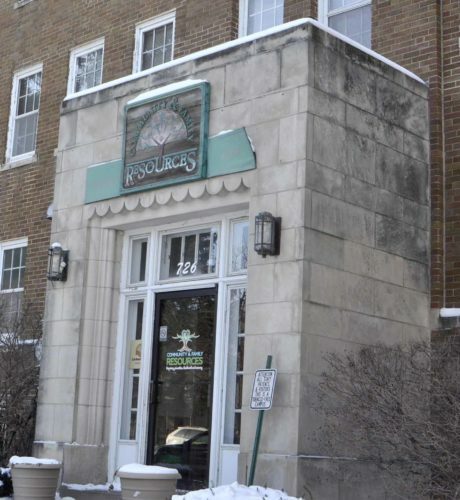 Additionally, the building’s boiler needs repairs. A planned general obligation bond issue includes $300,000 for the first phase. The Fire Department will start two new programs this year, according to the chief. One of those, called Fire Ops 101, is expected to start in the spring. The program will be similiar to the Citizens Academy conducted by the Police Department, but it will focus on firefighting and rescue work. Hergenreter said people in the program will put on firefighter protective gear and will have a chance to do things like handle hoselines. A new partnership between the Fire Department and the fire science program at Iowa Central Community College is being developed, according to Hergenreter. He said city firefighters will conduct some of the college classes and Iowa Central students will complete internships with the Fire Department. 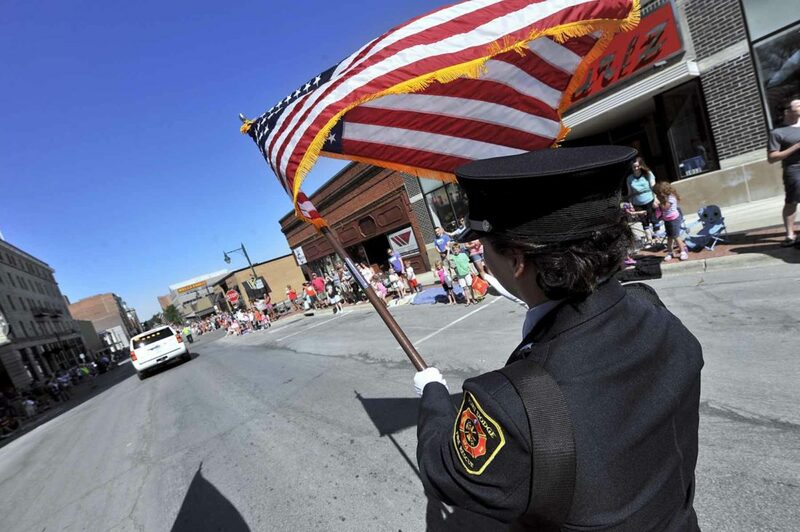 Fort Dodge firefighter Meghan Spears proudly carries the flag Saturday morning as she leads the department's trucks during the annual Frontier Days Parade Saturday morning along Central Avenue in downtown Fort Dodge.